“Not to be messed with”: that, we are told, is what the powers that be at Lexus wanted to get across with its upgrade to the NX line of luxury sports utility vehicles. And, like the genie in the bottle, the team tasked with the job, the boss’s wish was its command. Did it work? 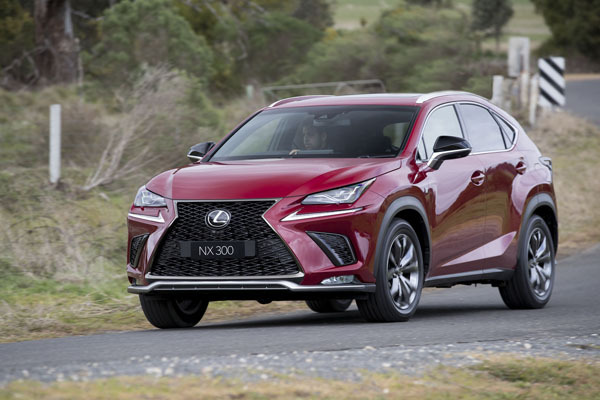 The ‘spec ‘n’ tech’ upgrade of the Lexus NX 300 late last year appears to have paid off, for strong demand for luxury sports utility vehicles has enabled the line to break sales records, increasing deliveries by more than 36.3 per cent so far this year. Lexus dealerships sold 638 NXs in the first two months of the year compared with 468 for the same period in 2017. While updating the contemporary design, driving dynamics and luxury features of its best-selling model, Lexus has also added two-wheel-drive variants to the F Sport for buyers who want the aggressive styling and sportier tuning at a more affordable price. This means the range now opens with the NX 300 Luxury two-wheel drive for $54,800 on the road and tops out with the NX 300 Sports Luxury all-wheel drive at $73,800. Petrol / electric hybrid versions are also on offer across the board from $57,300 on the road, while two enhancement packages add such features as moonroof, colour head-up display, smart keycard and 14-speaker Mark Levinson audio. We took a Lexus NX 300 F Sport AWD, which sells for $65,300. There’s also a hybrid version for $2500 more. In a nod to the sporty RC F, the performance-minded NX F Sport is set apart by its pronounced mesh grille that features a new vertical interwoven pattern. Dark chrome plating defines the grille frame, as used on RC F, while a new F mesh pattern is interwoven downwards through the grille, for a 3D effect. Sports grades have LC-inspired triangular headlamps with three LED low beam and 11-LED high beam, plus sequential indicators, with 16 LEDs per side at the front and six at the rear. The new styling front and rear has increased overall length by 10 mm to 4640 mm; with an additional 5 mm in overhang, front and back, while a new shark-fin radio antenna has increased overall height by 15 mm to 1645 mm. Vehicle width remains at 1845 mm, excluding mirrors. Corporate restyling has meant all F Sport models now have black rear-seat trim, regardless of the interior trim selected. Ornamentation has been spruced up throughout, including satin plating, metallic paint and chrome plating in key areas, and straight stitching has replaced (um!) wavy stuff. The interior facelift saw special attention paid to the centre cluster, with the navigation display enlarged to 10.3 inches (from 7 inches) and the number of switches reduced. In addition, the button design has been modernised and the analogue clock redesigned with increased contrast between the hands and background for ease of viewing. The clock is now linked to GPS, so the time is set automatically. A 4.2-inch TFT full-colour Multi-Information Display top section shows environmental information, such as temperature and time, while the lower section displays f information such as gear-shift position. It now incorporates a digital speedometer. The centre console has an increased surface area to its remote touchpad, integrating the palm rest into the overall design makes the pad flatter for greater comfort. The new touch function offers improved interface, smoother tracing and more refined visual appeal. A new frameless pad has increased the size of the operating area, making it easier to pinch-in and pinch-out maps. A sub-switch calls up a screen with related functions, such as air-conditioning and navigation. The Drive Mode Select switch has been enhanced by adding an L-shaped serration to the rim. 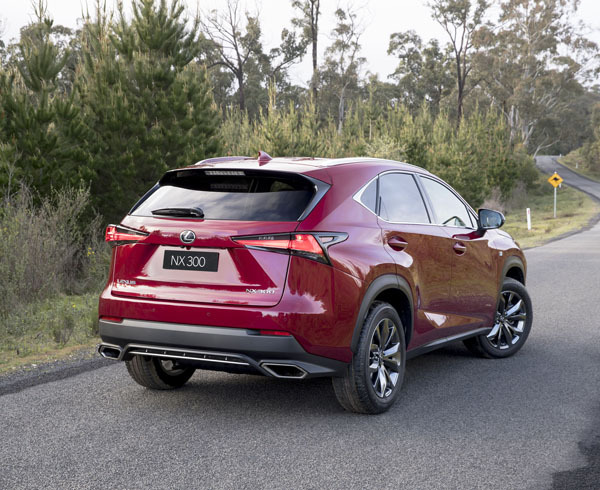 Lexus NX 300 makes use of a turbocharged 2.0-litre in-line four-cylinder engine, putting out 175 kW of power and 350 Nm of torque, mated with a six-speed automatic transmission and part-time all-wheel drive. The AWD system uses an electronically controlled coupling on the rear differential housing to control front / rear torque split from 100:0 to 50:50, according to driver intention, vehicle condition and available traction. It does so by using information on vehicle speed, engine revolutions, throttle opening angle, shift position, steering angle and brake application, and from two G sensors and a yaw-rate sensor. All models in the NX Line now have Lexus Safety System+ combining four driver-assist systems – Lexus Pre-Collision Safety System, including autonomous emergency braking, active cruise control, lane departure warning+ with steering assist and a grade-dependent automatic high-beam system – as well as blind spot monitor and rear-cross traffic alert. The PCS includes pedestrian detection, while the lane departure warning now includes steering-wheel vibration as an additional warning. Facelifted NX also has the additional safety feature of trailer sway control. It was a painful introduction to the test NX 300 F Sport AWD, well bolstered bucket front seats, together with a low roofline, offering a relatively narrow slot to slip into the driver’s seat – and the head took a knock. The reminder to bend more to avoid a bump stayed with me the rest of the time with the vehicle. Once inside the cabin, all was forgiven, with surroundings of quality and comfort expected of a Lexus. 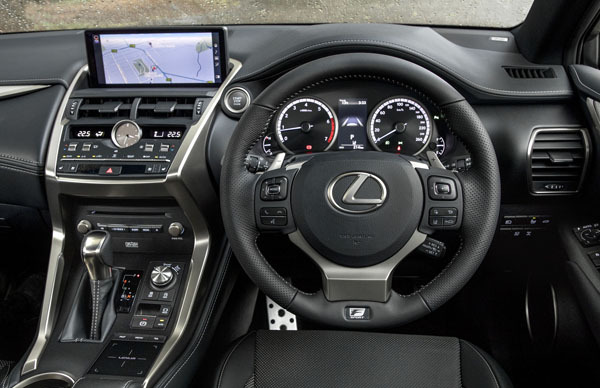 Fingerprints on the touch screen are a thing of the past with the control pad situated on the centre console. It took time for me to master the too-sensitive touch pad. Left-hand operation was an added impost for this right-hander. However, I much prefer the old joystick. Thoughtful changes include a larger console wireless phone charger, while the angle of the power outlet inside the console box has been changed, making it more visible and usable. Sadly, an improved head-up display is not available on the F Sport without shelling out an extra $6000 for the Enhancement Pack 2. Not surprisingly, with Drive Mode Select in Eco the NX 300 F Sport was decidedly sans ‘sport’, being quite sluggish off mark. A turn of the switch to Sport freed up the performance, while stiffening the ride. Much preferred. With fuel consumption of a combined 7.9 litres per 100 kilometres claimed by Lexus, test car figures of 11.8 litres in the city and 5.7 litres on the motorway seemed to be within the right parameters. The new, bigger 10.3-inch display screen has put new life into the reversing camera with the addition of wide view, giving the driver the choice of normal or wider range, while the Panoramic View Monitor has been further refined, with see through view of the vehicle. There are more sporty SUVs on the market, especially out of Europe, but the F Sport variants give added appeal to the already popular NX Line, so why go too far from the model. 2. Moonroof, 14-speaker Mark Levinson audio system, head-up display, smart key card $6000.